Remember those ads from the 50’s and 60’s, the aqua-car making it’s way from land to water, easily transitioning between the two? Here we are fifty years later, and even with the advancements in technology that we’ve enjoyed, we still don’t have that. This means that when your vehicle winds up in the water, it still sinks like a stone, and still has the potential to completely ruin it. It’s hard to come back from flooding, and you may be seeking scrapping options. 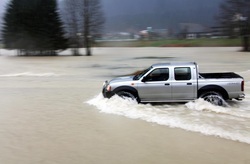 Your insurance company often won’t do much in the case of a flooded car, they may cut you a check, they may wipe their hands clean and back away completely, but one fact remains, you have a vehicle sitting in the bottom of a pool of water, and you need it out. Getting your vehicle towed from this situation can be the only option, and even when looking for a scrapping solution, you will still need to ensure that the vehicle is above water level. Choosing a professional nearby towing company can be your easiest solution. Once your vehicle is out of the water though, then the process of looking to a scrap option is capable. We only make this point because there have been a few past owners who assumed we had the means to do it all. At My Junk Car Buyer we have the necessary means to get your vehicle to a scrap yard, but not to remove it from a lake. When you stop by www.myjunkcarbuyer.com and look into your scrapping options, you can be sure that the towing from your vehicles dry location to the scrap yard is completely covered. Now we come down to the all-important matter to those looking to scrap their vehicle, how much is it worth? We covered this briefly in our FAQ, but to reiterate again here, the easiest way to find out is to head over to www.myjunkcarbuyer.com and use our handy tools there for a brief and simple quote. A more accurate number can be placed upon your vehicle when we have the means to assess the vehicle ourselves, but this is the best place to start to get a ball park figure. At My Junk Car Buyer we aim to give you as much as possible for your vehicle. When choosing My Junk Car Buyer as your scrap option, you can be sure that we operate above the table, and bring you as much accuracy and honesty as possible when it comes to the value of your vehicle. We know that there are a lot of companies out there just looking to make a dime on all the facts that you don’t know, but we aim to bring a better solution by providing you with as much information as possible, and ensuring that you get your vehicles worth, this works out to the benefit of everyone involved.